At this time of year the minds of many Loyalists in Co. Londonderry are cast back in memory of two brave young men from that county who made the ultimate sacrifice. Benny Redfern and Gary Lynch. Benny and Gary were two dedicated, courageous, hard working Loyalists who were prepared to do anything and everything necessary to defend their country and their community. Both were to die tragic deaths. Both cut down in their prime, but their sacrifice will never be forgotten, they will live on in the memory of all true Loyalists. Benny was from Desertmartin and was prepared to do whatever it took in the defence of his community and beloved Ulster. Benny was a well liked and respected member of the local community whom he strived to protect. Like many around South Londonderry and East Tyrone, Benny saw first hand the suffering being inflicted upon the Protestant community. Such incidents shaped Benny’s thinking and led him to become an Ulster soldier, joining the local brigade of the UDA at the age of 21. Benny’s fearless and loyal nature made him an excellent soldier and one whose memory will live forever. His excellence and great soldier like qualities quickly allowed him to rise up through the ranks of the UDA as a young man. Vol. Benny Redfern. Sadly missed by all who knew him. In 1977 the Londonderry and North Antrim Brigade lost a fine man when Benny was interned in Crumlin Road Prison and later charged in connection with the death of 3 Republicans, namely Joe McAuley, James Chivers and John Bolton. He was sentenced to 18 years in Long Kesh where he was also held in high regard by other Loyalist POWs. It was not in Benny’s nature to be locked up and he yearned to once again take the war to republicans, as he had so successfully done before his incarceration, which is why on the 10th of August 1984, Benny tried a daring escape from Long Kesh. Coming up with a plan to escape from the prison concealed in the back of a bin lorry. However, when he jumped into the back of the lorry, a tragedy occurred, the bin lorry was activated and Benny was crushed. Sadly he passed away the next day at the Royal Victoria Hospital. Many people lost a great friend and relative that day, but all of Ulster lost a true son and valiant defender. His death shocked and saddened so many in this local community and further a field where Benny was held in high esteem. Benny has since always been remembered as a great man of the local community and a brave soldier who took the war to violent republicans. Vol. 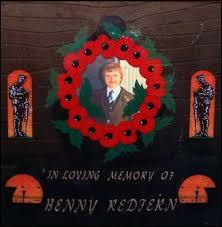 Benny Redfern will be remembered always by the Loyalist community in South Londonderry. Gary Lynch was a steadfast and dedicated young Loyalist, a member of the Ulster Democratic Party’s Londonderry Branch, and a popular and well liked member of his community. As a member of the UDP, Gary worked to try and bring about peace and reconciliation. Gary was also working on a number of community projects at the time of his death. An articulate and erudite young man, politically astute beyond his years, Gary was part of brilliant generation of young Loyalist politicos, alongside people like Gary McMichael and Ray Smallwoods. No doubt, had he not been cut down in his prime, Gary Lynch would have gone on to earn a senior position within the Ulster Democratic Party. ‘In Honour of Fallen Comrades’. 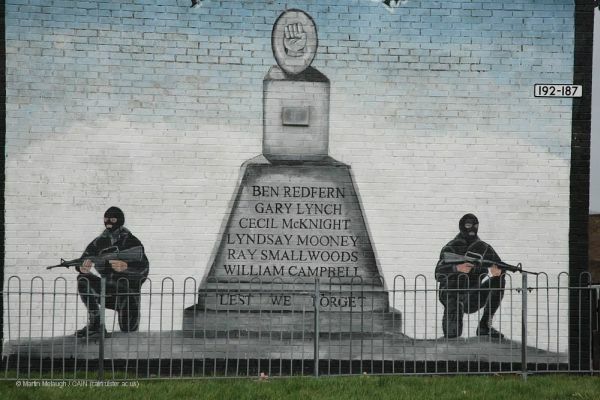 A mural dedicated to the memory of those men of L’derry & Nth. Antrim UDA/UFF who died during the long years of Conflict. “They went with songs to the battle, they were young.